When you need a Bicycle Accident Lawyer in Miami: It’s no secret that Miami is a car-dominated city. And getting a place to park your car be challenging and there is less way for most transit, which makes bikes to be the best option for traveling moderate distances. However, Miami doesn’t have many bike lanes as such, which makes the cyclist share the road with drivers. If the drivers are following rules of the road and pays close attention to their surroundings, we won’t have a lot of challenges regarding bicycle accidents. Unfortunately, we all seem not to pay close attention to our surroundings. This may be due to the driver focus on the traffic lights, other cars and things they shouldn’t even be paying attention to such as cell phones. This means they are not paying attention to the cyclist, and how you see as a cyclist can be compared to the vision of the drivers. And we all know Miami for reckless drivers and road that are not adequately maintained. This can all cause the cyclist accident. You as a cyclist could be hit by a driver making a turn without looking or making illegal turns as we know most drivers for, without looking through the rear mirror. You won’t have a car in between you and the other vehicles or road like most drivers. If you are involved in a bicycle accident at 30 or 40 mph can be extremely disastrous, painful, cause life-altering injuries or even lead to the death of the cyclist. Our Miami bicycle injury law firm has always recommended that cyclist should use their fitted bicycle helmet at all time they are on the road no matter how short the distance of the ride is to avoid a head or brain injury which can cause death in most cases. And if you have been involved in any bicycle accident, please do all diligence to replace the helmet if not even broken. And the helmet certified by ANSI is what we will recommend you get. Cyclists will need service of a lawyer with a vast knowledge of the dangers of cycling in Miami and who have the perfect understanding of the law to seek justice for the injured cyclist. Photograph the scene with your phone or camera if you have one with you, make sure you take a look at the plate number and contact the appropriate authority. Get the insurance information and contact information for a witness. You should have your insurance information, accident or emergency contact, and your personal identification. Then you should wait or the arrival of police to file your report, for them to document the incident and know the witness. Snap your bicycle and if possible the car that hit you. You should stay in that position until the police arrive at the scene. Don’t try and negotiate with the driver. 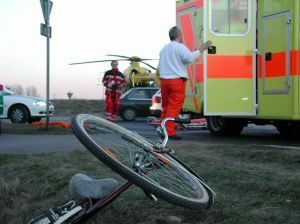 If you’ve been injured in a bicycle accident, contact the Miami Injury Attorneys of Madalon Law. Our team will fight and help you get the compensation and justice you deserve.